Harry is comatose by the fire, waiting for Spring. Wow - THAT was an easy winter, eh? It seems that we just put away the Christmas decorations and now it’s almost time to uncover the patio furniture. I didn’t accomplish nearly what I had intended to over the winter. My stacks of new gardening books are still only partially read, and my inbox is chock full of “how to” gardening blogs, seed catalog emails and instructional videos that I still haven’t watched. But alas, April is the cruelest month here in New England, and there will be plenty of time yet for catching up by the fire. Meanwhile, our piles of snow in New Hampshire are almost gone as of this date, but much of the ground is still frozen. This makes for rough going and cold paws, so 17 year old Harry prefers to wait it out a bit more before venturing forth to find a sunny patch near his beloved catmint. Many clients are asking is it time for Spring cleanup yet?. The short answer is…not quite. I left 99% of my perennial garden untouched last fall, opting to leave the dried plant stalks standing for winter interest as well as for insect and animal habitat. So, my garden is definitely in need of a buff and puff. But, not yet. I did venture out this weekend to gather up barrels of fallen pine boughs and birch branches, but will hold off on any serious garden cleanup until the weather has warmed to where we have day time temps consistently in the 50’s. This will help ensure that pollinators and beneficial insects that over wintered under the leaf litter, mulch and last year’s perennial debris have had a chance to emerge in search of plant nectar. I prefer to work on the insect’s time table to ensure their plentiful population in my garden this season. I’ve learned that aggressive spring cleaning can be quite disruptive to the little beauties, and I hate to think of inadvertently tossing them in the compost bin or - worse yet - to the curb side for hauling to the land fill. So, a bit more patience is advised for now. We also want to be super careful about tromping around in garden beds that could be water logged from recent rain and snow melt. Lurking beneath the soil surface are complex root systems and plant crowns that can suffer from foot traffic that compacts the soil and destroys its structure. Please tread carefully, or lay down stepping stones or wide planks if you must walk in the garden! At this time of year, I’m frequently asked: is this plant dead?. As I inspect the various trees and shrubs in my own garden, I’m reminded of the challenges faced by new or less experienced gardeners this time of year. SO MANY THINGS look dead! And they may continue to look dead for a few weeks to come. Plants in our Zone 5b have evolved to remain dormant until the soil warms and the threat of killing frost has past. Have confidence in their ability to burst forth again with beautiful foliage and bloom in the coming weeks! So, how does one know whether a shrub or tree has given up the ghost or is simply a late riser? 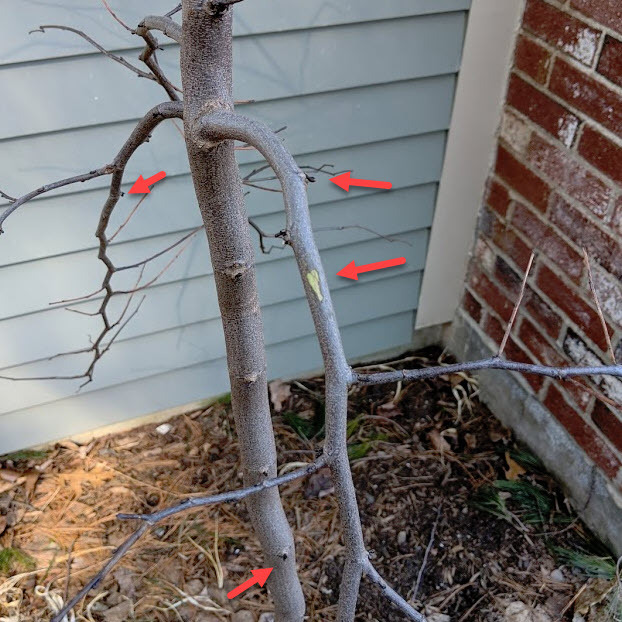 Before you give up on a woody shrub, try this simple test to determine if it’s alive. Lightly scratch the outer bark with your thumbnail. If you see evidence of the limey-green cambium layer, then it’s alive! If you don’t see green, then it could be that that particular section didn’t survive the winter, but others did. So, repeat the scratch test on other branches and twigs. If in doubt, just wait a few weeks for signs of life. Rhody's green cambium proves it's still alive! Of course, a frequent, burning garden question that I hear every year is can I prune my hydrangeas now? The answer is: “it depends on the species”. If your garden contains the traditional macrophylla, (aka “mop head”), quercifolia, (aka “oak leaf”), or petiolaris, (climbing) varieties that bloom on “old wood”, then you need to wait. Pruning them now will result in fewer flowers this summer. Of course, pruning for overall shape and health, if fine. Just be willing to sacrifice a bit of color this year. For all of these types of hydrangea, hold off on pruning until after they bloom, typically in late summer or early fall. Prune panicle hydrangea just above the node to encourage lateral branching. If you have the newer varieties of “panicle” hydrangea like “Quick Fire” or “Lime Light”, then yes, prune them now! Hydrangea Paniculata species bloom on this year’s growth, and since new growth won’t begin for a few more weeks, it’s safe to prune now. If your panicle hydrangea are planted in sun, you can anticipate that they will easily put on 12” of new growth this year. So, prune accordingly to keep their growth habit in check and so they fit their allotted place in the garden. When pruning hydrangea it’s important to make a clean cut just above a “node” as shown to the left. This type of nodal cutting will stimulate lateral branching, and if done properly, can control shape and direction of growth. Avoid “internodal” cuttings along the sections between the nodes. These will result in ugly snags and will be less likely to encourage lateral growth. First, clean and sharpen your pruners. I use a Brillo or SOS pad to remove rust and sticky plant residue. I then use a small knife sharpener to create a clean, sharp edge. Now you are ready to prune! Remove dead, broken or otherwise injured branches. Prune at the crown, or at the largest primary branch. Remove “water shoots” - these are branches that shoot straight up from the crown and have no lateral branches. Cut these as close to the crown of the plant as possible, being careful not to cut into the crown itself. Remove “crossed” branches to minimize the chance of damage as they rub against one another. Remove any small, tangled branches, especially those growing close to the ground. Remove height by pruning one branch at a time just above a node. Vary the height of your branches to create a more natural look and habit. Spring time can really mess with a gardener’s head and confidence. If you need clarification on anything in this post, or have other burning garden questions, feel free to reach out! Meanwhile, stay tuned for updates on the escapades of Harry in The Big Little Garden, as we lurch into Spring. If all goes well, we may announce some Open Garden Days in June when the highly anticipated Allium show begins.